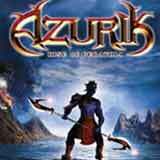 Azurik: Rise of Perathia is one of the deepest, most immersive 3-D action-adventure games developed for Xbox. Players assume the role of Azurik, a young apprentice sworn to protect the sacred elements - fire, water, earth and air. As Azurik, players travel the vast realms of the elements on a mission to stop the progress of an apocalyptic prophecy already in motion. Action - Axion style. A revolutionary weapon system lets gamers unleash the fury of the elements with attack powers and shields in a fraction of a second. Every great warrior knows his weapon well, Azurik must balance brains and brawn to defeat his enemies. A huge, seamless universe powered by the Xbox hard drive. The world of Perathia is an immense environment with regions dedicated to the elemental realms air, earth, water, fire, death, and life. Each region is a feast for the eyes with incredible rich textures, dynamic lighting, real shading, and spectacular particle effects the world will seem truly alive. Smart, dynamic enemies. A vast array of unique and ever-changing creatures work together; flocking, swarming, and riding one another to present dynamic combat challenges. Each creature has its weakness; find it, and exploit it to win. Be careful once night falls, some things are not as they seem.